On June 25, the Abu Dhabi Global Market (ADGM) launched a regulatory framework for spot crypto asset activities with the goal of creating a safer and friendlier marketplace for digital currencies. 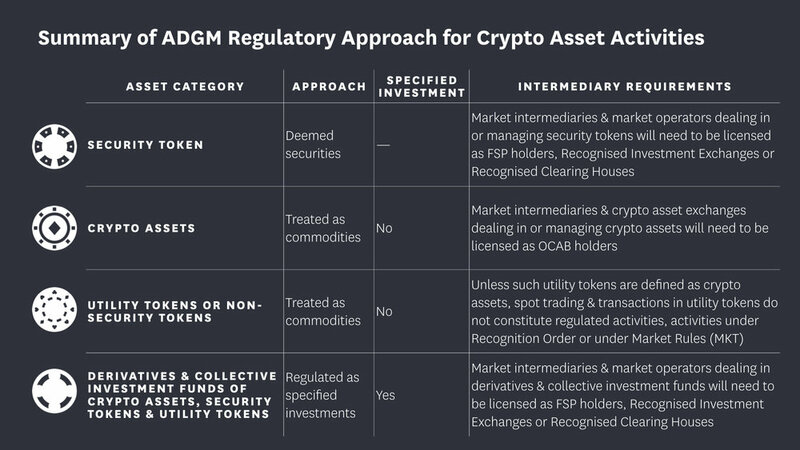 The new framework, which broadly treats crypto assets as commodities, governs activities by exchanges, custodians, and other intermediaries within ADGM. The announcement has been a long time coming. The rapid proliferation of crypto assets coupled with a number of high-profile hacks — most recently involving a $31m breach of South Korea-based exchange Bithumb — is forcing regulators to play catch-up. Across the world, countries are trying to strike a balance between providing a safe environment without clamping down on digital assets that would discourage investment and innovation. In the UAE, leading innovation and being at the forefront of new industries are top priorities — federal and local governments, particularly Dubai, are pursuing cross-sector implementation of blockchain, the technology that underpins cryptocurrencies. The country launched Emirates Blockchain Strategy 2021, Dubai Blockchain Strategy, and Dubai Paperless Strategy to streamline government transactions and capitalise on an economic opportunity that could save up to $1.5m by 2020 for Dubai alone. Meanwhile, in the crypto space, enthusiasts have enjoyed the grey area afforded them as UAE federal and local governments hammered out the details of an otherwise ambiguous regulatory climate. As the country finds its footing with crypto assets, it will need to take measures to ensure these new currencies are properly regulated to protect against crimes such as money laundering, fraud, and theft. ADGM cites multiple key reasons for the new framework, including fighting inherent risks such as financial crimes and money laundering, fostering wider acceptance of cryptocurrencies, and the desire to court institutional investors. Moves by ADGM bring the UAE closer in line with countries like Singapore and to some extent the Philippines, which is experimenting with the expansion its own of crypto asset exchanges. Countries like China, Pakistan, and India are adopting a much more heavy-handed approach to the cryptocurrency regulation puzzle. The countries are cracking down on digital currencies with such strict regulations that their once friendly environments are now much more hostile. In India last week, the Supreme Court upheld a ban on crypto exchanges doing business with regulated financial institutions. The State Bank of Pakistan has threatened prosecution for those who transfer funds outside of the country using digital assets. China has attempted to ban digital currencies altogether, prohibiting ICOs and domestic cryptocurrency exchanges. Whatever their rationale, such measures not only stifle innovation but do very little for economic growth if digital currencies are embraced and normalised worldwide. As the UAE moves forward into a future that almost certainly includes widespread use of digital currencies and blockchain technology, growing pains such as finding the right balance for regulation, not to mention handling the ever-increasing storage capacity required for blockchain ledgers, will need to be met with an eye for both financial safety, consumer confidence, and fostering innovation.